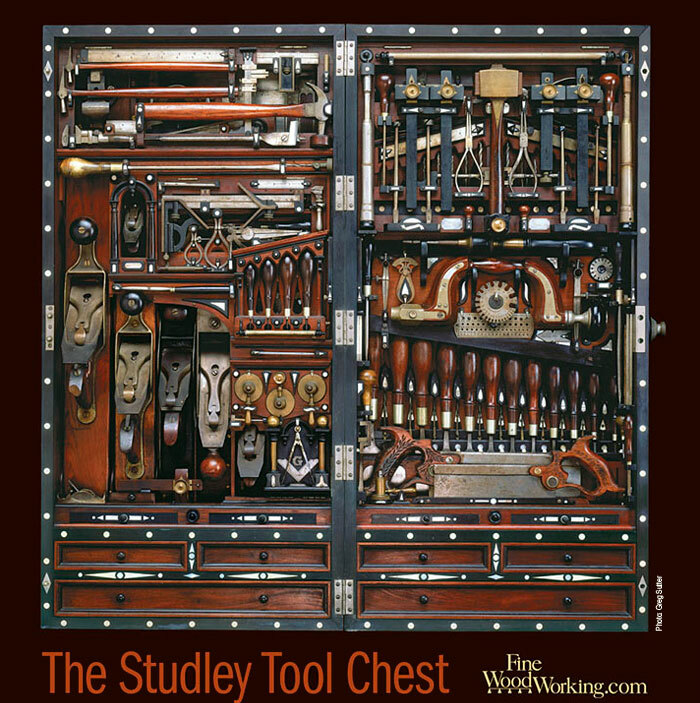 Massachusetts piano maker Henry O. Studley built his magnificent tool chest in the 19th century using ebony, mother-of-pearl, ivory, rosewood, and mahogany — refining it over the course of a 30-year career. 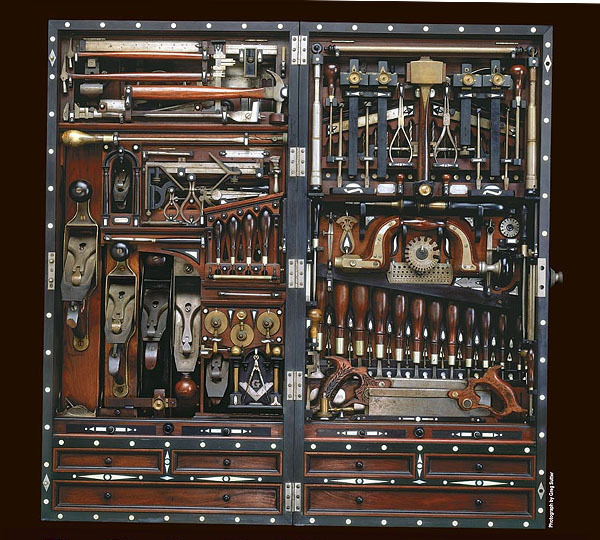 However, in the past 30 years as it has changed ownership and gone on and off of display at the Smithsonian Institute, the tool chest has undergone several repairs and missing tools have been replaced. We asked readers to help us compile a complete list of visible changes to the chest, and their findings are detailed in the two images below. 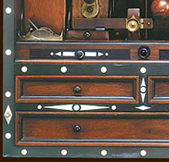 Most of the repairs to the chest were made to the mother-of-pearl inlay that decorates scores of parts on the tool chest. 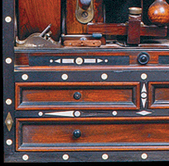 Readers identified more than a dozen spots where the inlay was repaired or touched up, mostly on the darts between the drawers. 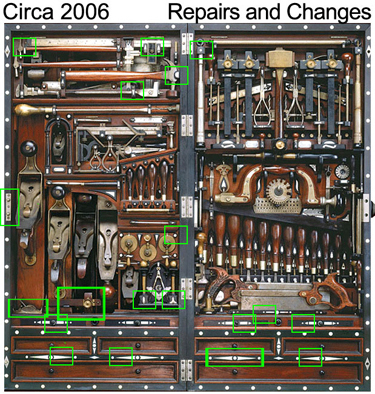 Another significant repair was to the catch on the left side of the box; it was missing in the original image. 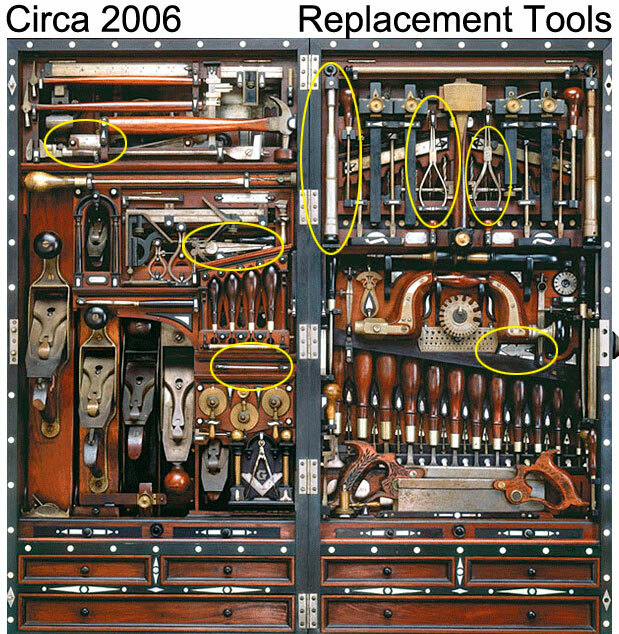 Finally, a number of tools have been rotated or rearranged. In fact, readers identified too many to many to list, and some that are barely visible to the naked eye. For example, Bob Satterlee of Madisonville, Louisiana, noticed that the three round brass tools above the Masonic symbol (which was also touched up) have been rotated. And another reader named Alex Marx noticed that the catch on the end of the claw hammer has been rotated slightly. 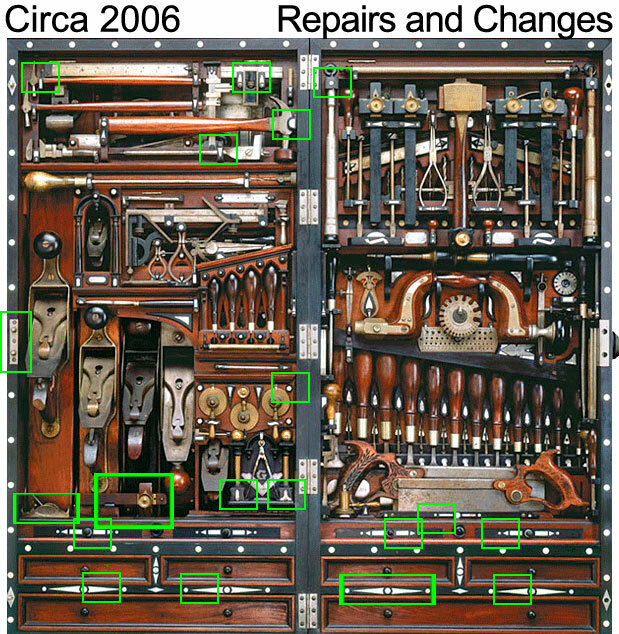 The most noticeable tool to be added back into the case is the long telescoping tool (unknown) on the right side of the box. To the right of that tool, a set of needle-nose pliers has been added, as have four drill bits located behind the pair of pliers. Additionally, a rule was replaced on the left of the box next to the claw hammer. 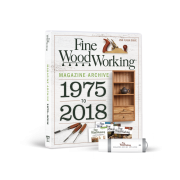 To see the changes in live motion, view this animated image prepared with the help of Brian Bush of Little Rock, Arkansas. 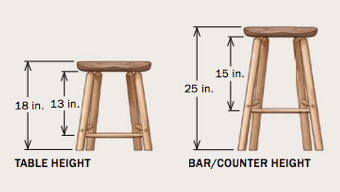 Note: The animated image is a 1.5 MB file that may take a minute to load depending on your Internet connection. 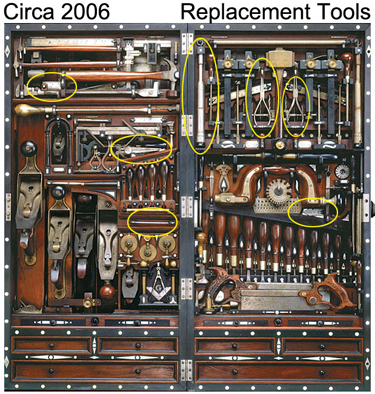 Click on the two close-up images below to study before and after photos of the tool box. 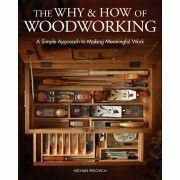 Ivory inlay and an ebony knob are missing, and a loose tool part is resting in front of the marking gauge. 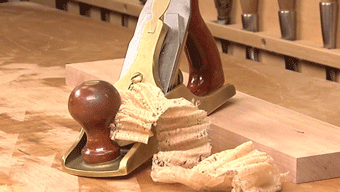 Ivory inlay and the missing knob have been replaced, and the small block plane and marking gauge are rotated in place. 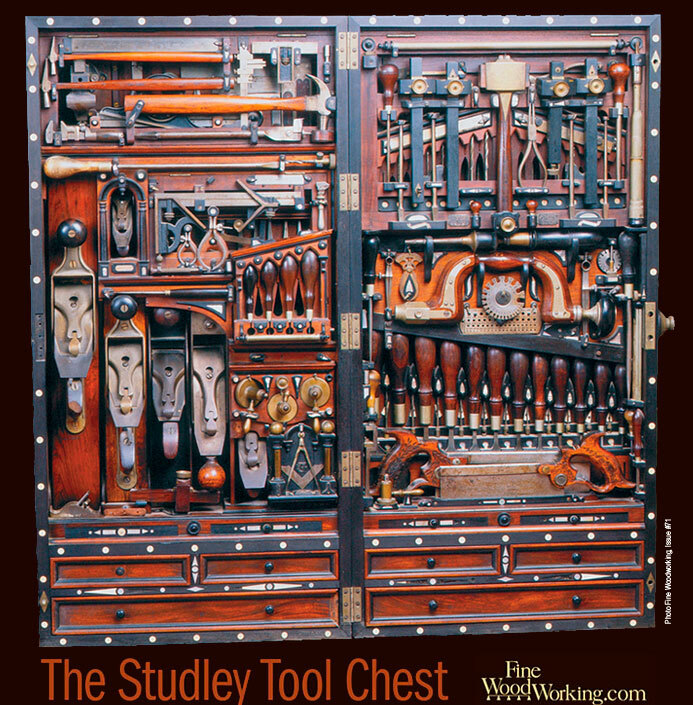 Massachusetts piano maker Henry O. Studley built his magnificent tool chest in the 19th century using ebony, mother-of-pearl, ivory, rosewood, and mahogany – refining it over the course of a 30-year career. Learn more about the tool chest and download wallpaper for your computer desktop by clicking on the companion article below. 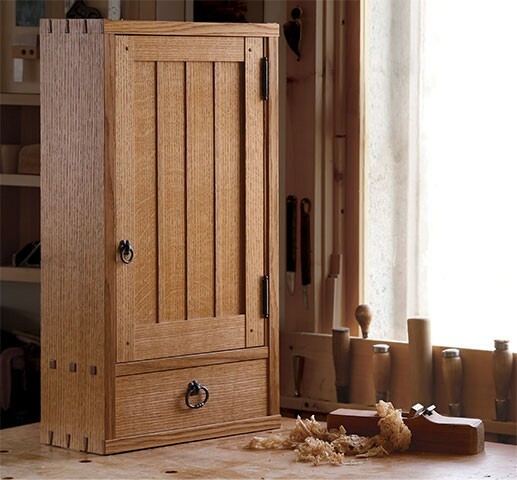 The "unknown" tool that was added back into the cabinet is, most likely, a piano tuner. 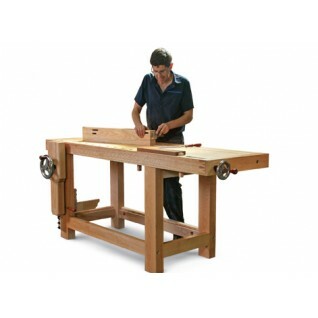 When I was a child, my mother had an upright grand piano and when the tuner came in to tune it, I remember seeing such a tool that fits on the pegs of the strings and allows the person doing the tuning to tune each string independently. I've seen two tuning professionals in my life and both were blind and had perfect pitch.